» My SPOT » Commentary » Is Your Caims Department Becoming A Bus Company? Is Your Caims Department Becoming A Bus Company? 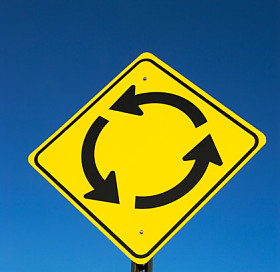 Are you going through the motions and can’t seem to get out of the traffic circle? Recognize any of the above? Claims departments can, and do, fall into the same traps where it feels like they can’t get out of the same old routine. Closing Day – Spend a day dedicated to closing files or looking for closing opportunities. The idea here is not to work the files, but to glance through them quickly and see if there are any files that can be closed. Even with the best diary systems in place, there are always files that some how didn’t get closed. Whether it’s a file that had a statute of limitation expire, or one that had been denied with no appeal, dedicating time to focus on closings only will pay dividends. Not only does this type of day break up the normal routine, it can result in a reduced pending, the lowering of reserves and feelings of accomplishment. Take a poll to find the roadblocks– Ask your claims staff for the top 5 issues that they feel make their jobs difficult. Is it a system problem? Is it an inability to get information from other departments? Or maybe there is a process that is not adding any value, but is taking up much of a handler’s time. You will of course receive the standard complaints, but if you dig into those complaints you might find a common theme that could be correctable. If you have never asked you may be surprised to learn of a roadblock that can easily be removed to make the handler’s jobs easier. You will also benefit from learning more from your claims professionals and giving them the opportunity to be part of a solution. War Story Lunch – Claim handlers love to tell war stories so why not give them a forum to let loose and share the information. The experience and teachings learned from war stories can be used as a training tool to make the department stronger. Invite claims handlers to lunch and have each claims professional bring a story of success or failure from their past. Claim handlers can use that information to promote out-of-the-box thinking and learn new ways of handling future problems. Want to get even more from the process? Invite underwriters to come and listen – maybe they will learn a thing or two about the risks they are writing. Changing the way things are looked at and done in a given day will promote new ways of looking at old problems, and will keep your department fresh. Tired staff, punching the time clock attitudes, or by the book mentality, with no room for initiative is a sure way to become a bus company. How do you stay off the bus and stay out of the traffic circle? Tagged with Claims Operations, Claims Trends, Improve, Innovation, Management.